Businesses generate a lot of data and often it becomes tough for them to manage the unproportionate data growth and subsequently resulting in high data space consumption. As Salesforce’s additional data storage cost is relatively high, enterprises often look for alternative approaches where they can take care of their historical Salesforce data without deleting it. This is where DataArchiva comes into the picture by efficiently addressing the challenges and helping organizations archive their historical or less used Salesforce data (e.g. old emails, contacts, cases, leads, etc.) by storing it securely at a native level in Salesforce’s big data based storage system called ‘Big Objects’ without compromising data integrity with seamless access. In our upcoming webinar, we are going to talk about the key features and how the solution is helping enterprises make their historical data archiving process seamless. With a few of our customer use cases, we will discuss how DataArchiva helped them address their Salesforce data storage challenges along with saving significant costs. Don’t miss out this action pack session. 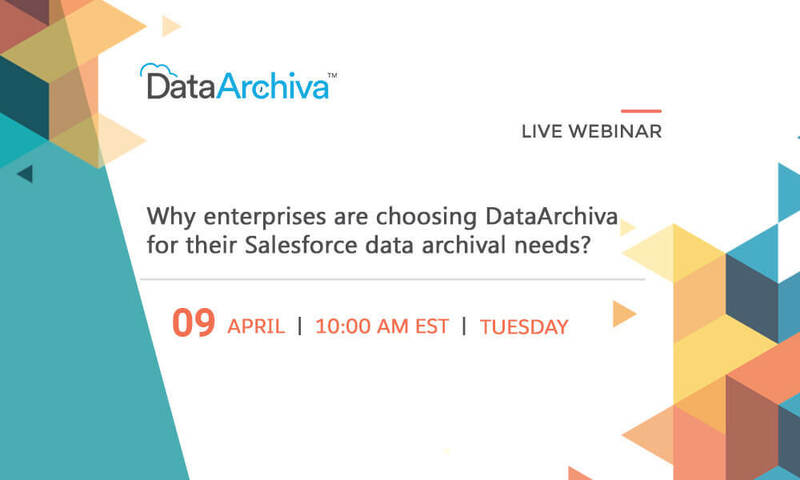 By: Admin Comments Off on WEBINAR: Why enterprises are choosing DataArchiva for their Salesforce data archival needs?